Ride the legend, just don't swallow the hype. Harley Davidson; an image that any marketing man would kill for. As all-American as Walt Disney or Coca-Cola, and known by adolescent males, of all ages, the world over; the epitome of motorcycling cool. And boy do Harley know it! In the UK they have come from near obscurity to be a serious player in the motorcycle market, and in the last five years you simply weren't happening unless you had a Harley in the garage. Being good old fashioned American capitalists, Harley have milked this success for all it's worth, and now you can buy a whole lifestyle of official HD branded goods to go with your cycle. Start with the obvious leathers and boots, and as the obsession deepens you can get everything from knickers to knick-knacks, all with that famous logo. The trouble here is that the enormous success of the brand has been in danger of overshadowing the actual product, the bikes. There is a very fine line between cool and ridiculous. 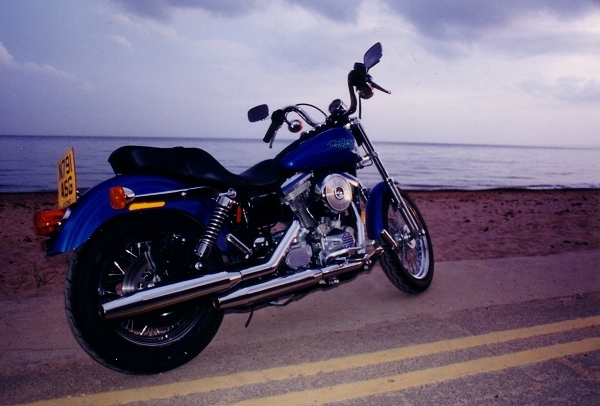 I had never ridden a Harley Davidson of any description until I collected the demonstrator for this article. It has not been for want of opportunity, but two thing kept putting me off. First was the whole business of image, and whether I wanted to be seen on one, and second was that I found them just too intimidating. These are seriously heavy machines, and I didn't want to make a fool of myself by dropping it as I negotiated the first junction onto Leith Walk. It was therefore with very mixed emotions that I saddled up on Easter Saturday morning for 4 days of the "Harley Experience", and I determined to put all my preconceptions behind me, and assess the bike objectively, as just another chunk of machinery. In essence, Harley really only make two bikes. 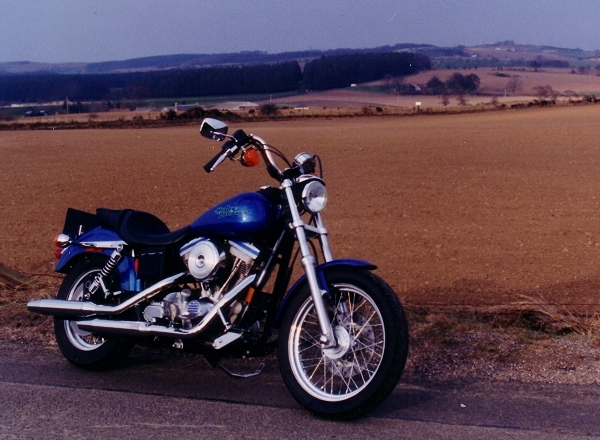 There is the Sportster range, built around the "small" engine in either 883cc or 1200cc versions. Then there is the "big" range, and common to all of these is the 1340cc V-twin "Evolution" engine which is the heart and soul of the bike. You can buy this in umpteen variations, but it is essentially the same bike. 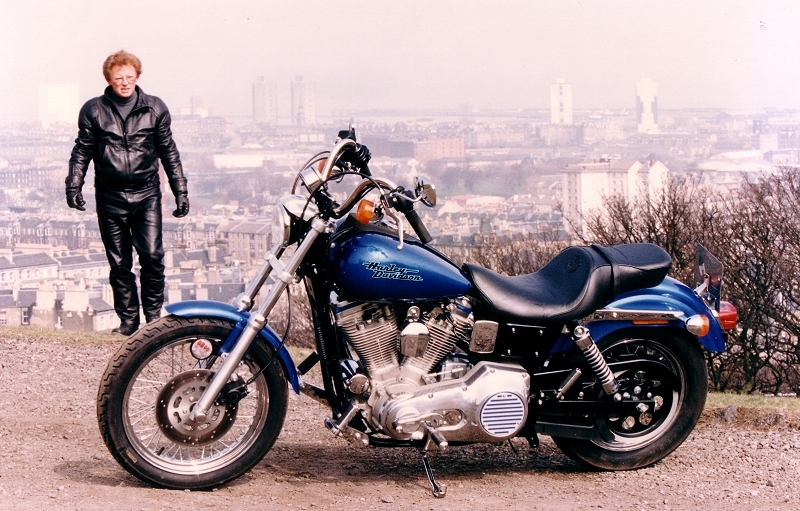 Chosen for me was the entry level model of the larger bikes, a Dyna Super-Glide FXD, a basic unfaired bike, smaller and neater than the real behemoths, the Electra-Glides, but still a mighty bit of kit at 600lbs dry weight. Do you know the sheer agony of tee-ing off on the first fairway of an unfamiliar golf course, with a crowd of low handicap golfers impatiently watching your every move? Well that feeling has a lot in common with the first 200 yards on an unfamiliar large motorcycle. My first surprise then is that this bike lifts off the clutch as sweet as apple pie and mingles into the traffic with no problem at all. To find this so unintimidating is the equivalent of hitting that anxious first ball a stonking good shot, and just as in golf, a good start lifts your whole game. This looks promising. The second surprise is the deftness of the controls. The various pedals and levers are all macho man castings or fashioned out of girders, and you would expect to be Rambo to operate them, but looks deceive and brakes, clutch and throttle all work with a pleasing action. The indicator switches are a model of clarity, and the clumsy looking gear pedal snicks through the box easily, even if finding neutral is a pig. Yet another surprise is the engine. You would expect a low-revving unit that was tractable from zero revs, but which won't spin. Wrong again, as this engine is quite the reverse, surprisingly nervous at low revs, yet throttle sensitive enough to allow a delicious snick on the twistgrip for neat downchanges, and as smooth as oiled silk in it's mid range. To meet current regulations on noise, pollution etc, the current Harleys are a shadow of their former selves. Restricted carburation and heavily padded silencers make this bike whisper quiet. Not quite the "rolling thunder" that Harley like to promote, but a necessity these days. It is an open secret that the first thing most owners do is to de-restrict their bikes by changing the silencers and re-jetting the carb. Not having tried the bike in modified form I cannot comment, but I rather like it in it's unobtrusive form anyway. Easter Sunday, and at last my chance to ride the thing away from town. From Fife I head up to Loch Earn for the afternoon, always a favourite run. The weather is cool and grey, but it seems better further north so I keep going. Killin is awash with tourists, (is this a good omen for this years tourist trade? ), and as the Harley climbs the road up Ben Lawers we suddenly burst into bright sunshine. Amazing what sunshine does to you on a bike. What had been an indifferent day out, changes instantly and my spirits soar as we roll down into Glen Lyon, my favourite glen. Snow capped peaks, clear blue sky, roaring brackish water, silver trunks and the coppery leaf litter of the beech forests form a sliding backdrop as me and my Harley glide down Glen Lyon, round the back of Aberfeldy, down Strathtay and over the rickety bridge above the raft crews, through Dalguise and down to the A9 at Dunkeld. The summer curse of caravans are not yet out in profusion and the roads are all mine. Half an hour of pure, undiluted magic. The Harley is not really a fast bike, but on these sort of roads you surf on a thick wave of torque, which if you get it just right is deeply satisfying. The combination of a close ratio five speed box, a slick throttle and a good gearchange means that you rarely touch the brakes, just using engine braking to prepare the bike to swing through the bends. A further surprise is that the bike really handles too. Granted it is no race track escapee, but it stops goes and corners with an aplomb that is way ahead of what it's glitzy custom cruiser looks would have you expect. This ride is a real revelation, all the more so when I fuel up in Perth and find that the bike has been averaging 52 mpg, a lot better than expected. Maybe there is something to be said for restricted carburation after all. Easter Monday evening and the weather is perfect, so I decide to take the bike out for some photography. I park it just off the beach at Lower Largo, angled just to pick up the last pink rays of sunshine on the chrome, with the sea calm in the background. Through the view-finder, polished and sparkling in the fading light, there is no doubt that this is one gorgeous looking motorcycle. Sure, parts of it look like the local smiddy made them and some of the technology is stone age, but it looks a million dollars, a classic American heavy cruiser, the real McCoy. I am not the only one who notices it, as in the half hour or so that I am there, everybody, but everybody, who passes stops to comment. It just has that effect. It is that image thing again. Tomorrow I have to hand it back, and I don't mind admitting that if I had the money, I would rather send them a cheque instead, and keep it. I started as a cynic, expecting to be underwhelmed by the bike and intending to write a witty put-down of the whole Harley cult. Instead my 3 days and 400 miles by Dyna-Glide have made me appreciate it as just a plain good motorcycle. Forget all the image stuff, forget all the clever put-downs in the motorcycle glossies, and just try one with an open mind. You just might get more than you expected. I did.